Yes – another new start. 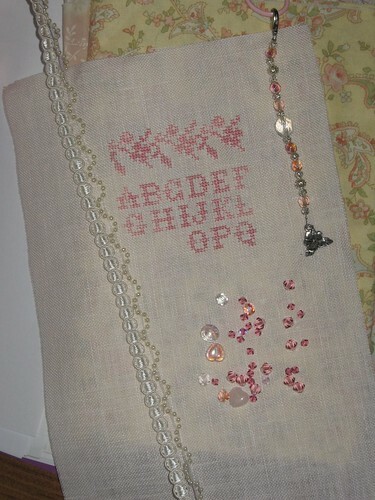 I was inspired by this project at Sohpie’s blog. 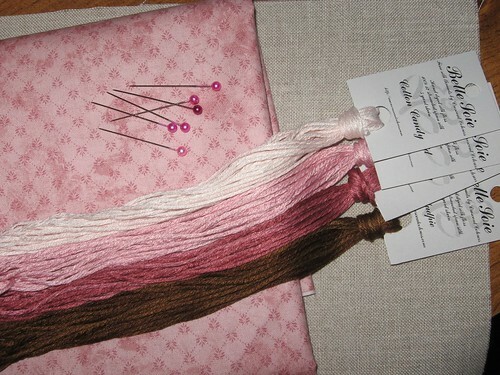 I’ve had a skein of Old Rose silk from Northern Lights for a long time now, just waiting for the right project. The chart is a free one found here. I was also inspired by a photo from this blog. 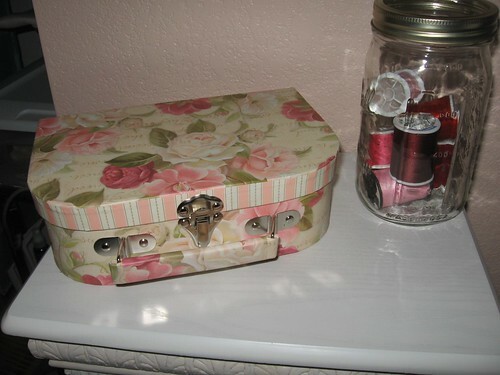 I think I still need one more jar and my sewing thread will be pretty and organized. 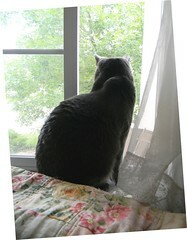 You can see I found yet one more half-price box that I had to have – I walked away from several others, beleive me! 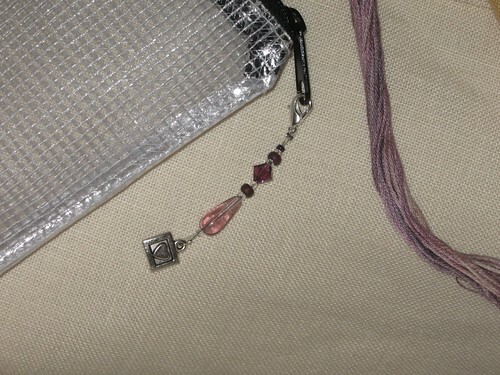 I’ve added some fobs to the fundraising Pink Page at my webshop that I hope will be inspirational. When I think of what my little worries are compared to someone facing breast cancer, it really puts things in perspective! 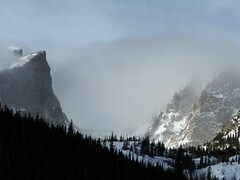 I wanted to squeeze a crafty picture between my bit of snow this morning and Rocky Mountain Wednesdays tomorrow. 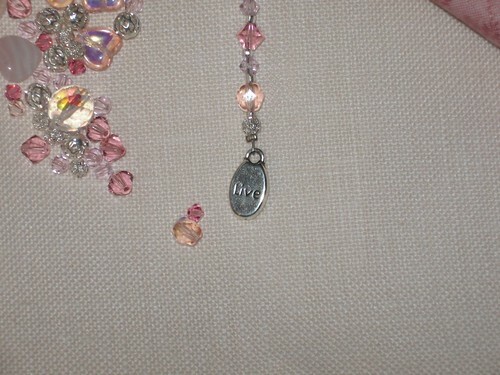 Here is a big hint about the Breast Cancer Awareness Project that I’ve designed. 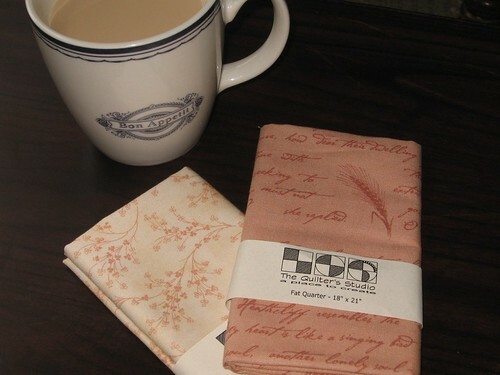 The fabric will be part of the kit and is part of the Quest for The Cure fabric line from Northcott Fabrics. 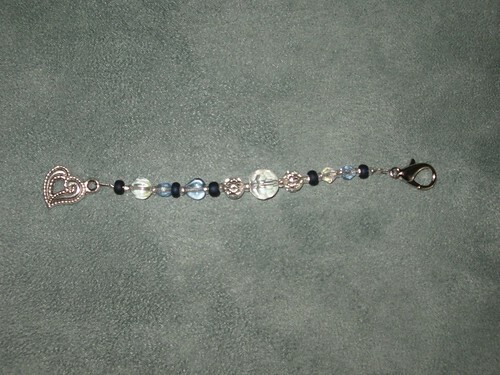 I’ve been busy beading too, there are some new fobs and pulls at the Fobs 4 Sale link at the top of my blog. I noticed a new bead shop earlier today – I’ll have to stop in I think! You can see the new fob I made for myself here along with my little pincushion ort basket. I also painted up this little $5 table from Michael’s and glued some scrap book paper to the top. Time for the Tae Kwon Do taxi to hit the road – bye for now. 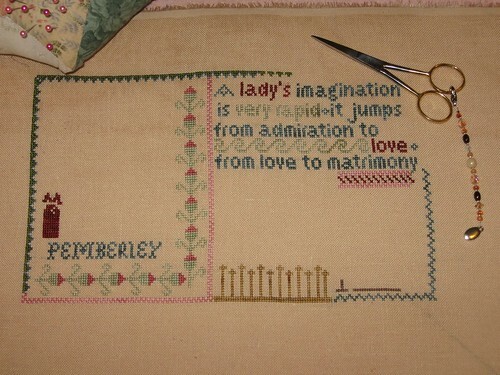 I’ve made a little more progress on the Pride & Prejudice Sampler from The Sampler Girl. 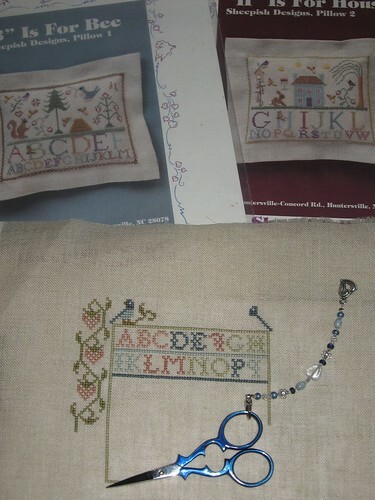 I hoped to be a bit further than this but my stitching time seems to be eaten up but other things lately. I did get a fair bit done this evening and hoped to really post this at the end of August but see that it is already past midnight – happy September! 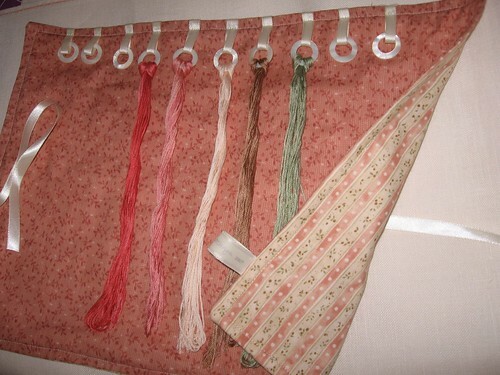 I had a special request for a threadroll like the pink one I made. I offered several fabric choices and this is the result. I think it is very nice in blue too! 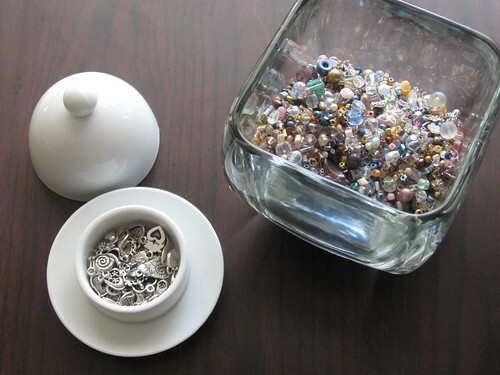 I’m making some tiny fobs for zipper pulls – I really enjoy working with beads and I’m thinking about making a beaded tieback for my workroom curtain. Jerry, Ethan, and I went on an outing to Home Depot mostly to buy a closet rod for a new closet, but I also checked out some detailed moulding for picture frames for my Jane Austen Sampler wall. I think I found just what I want, Jerry will make the frames for me. I just need to decide what kind of finish I will put on the wood. Still no final grade for class. I wonder if the professor is ill or something, it is past time when grades should be submitted. 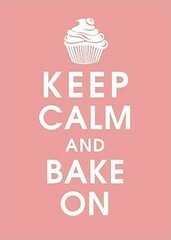 Have a lovely weekend, a long one here in the US! 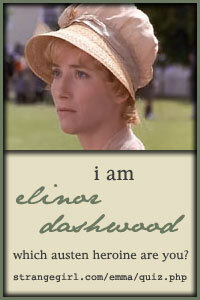 More Austen, other books, and a cranky little man! 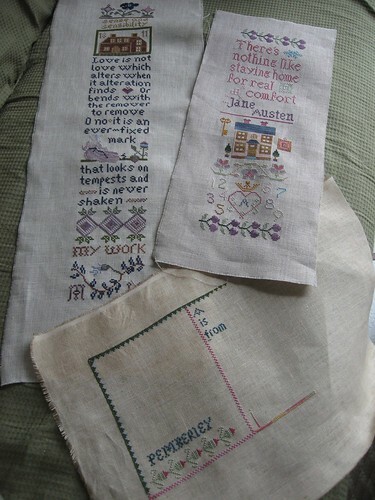 Well, here is my bit of progress on The Sampler Girl’s Pride & Prejudice Sampler along with my 2 finished Austen Samplers by the same designer. I’m planning a wall full of these designs. I’m just using random colors from my stash to stitch this, it is fun to work on a sampler without using the color key – I do look at the picture a lot! 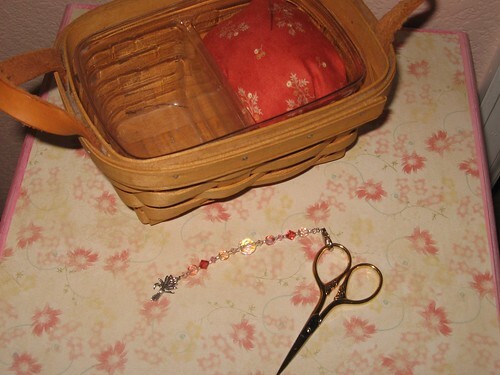 Sharon shared her great idea of using beaded fobs as zipper pulls on mesh needlework bags. 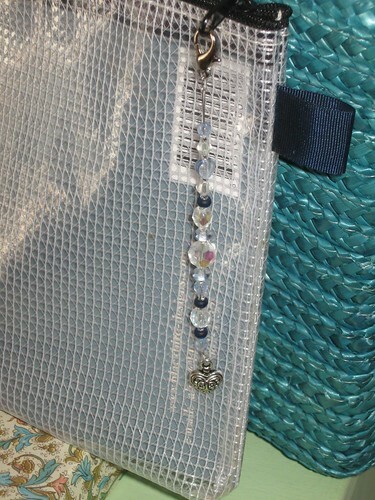 I also shared it with the needlework shop owner that is now carrying my fobs and she loved the idea. 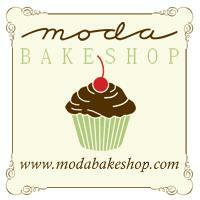 I hope for more orders from there! Ethan has been so horribly cranky today. Happily Jerry was home for a bit between work and class so I ran out for a few minutes of peace and quiet. 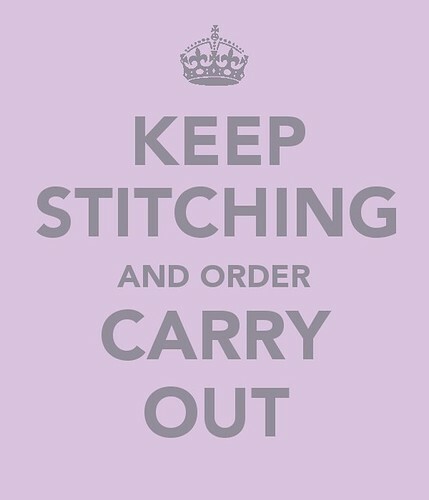 I stopped by a quilt shop that I rarely visit – they aren’t the friendliest to people who come in with a stroller and never seem to have anything I’m looking for, but they are on the same block as the cross stitch shop where I had to drop off fobs, I could walk to both without moving the car. I picked up two fqs. 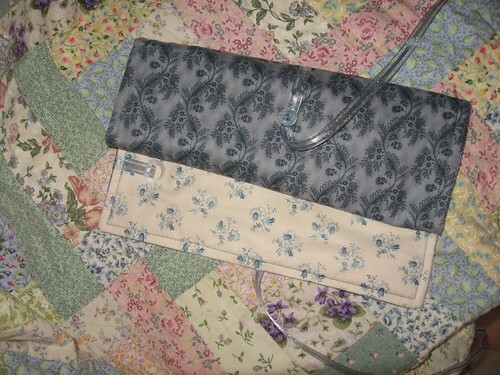 The one with writing has some references to Wuthering Heights on it that I can make out. I also stopped for a coffee and poured it into my cup when I got home! This macaroni salad is a summer staple at our house. Tyler and Ethan love it (Kellen would rather eat dirt). 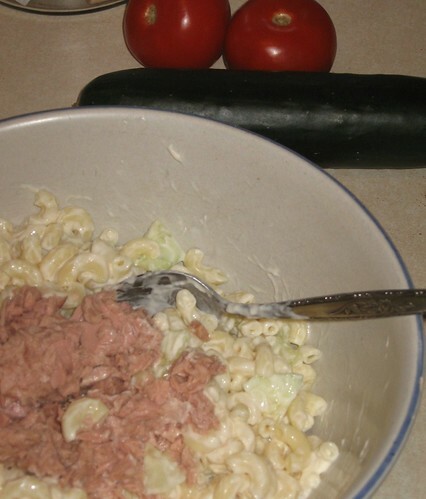 It is a cucumber, a can of tuna, macaroni, and miracle whip. So easy and pretty yummy. I downloaded 2 more books from Audible – they are having a great sale that ends tomorrow. Jerry wanted ‘The Lost Colony’ (Artemis Fowl) and I downloaded a book called ‘The Shadow of the Wind’ for me. I love listening to audio books when I stitch. We don’t have TV (we can watch dvds on a screen but no cable, dish, or reception of any type), so I often spend the evening either listening to a book or to music if I’m stitching. If you ever decide to sign up at Audible please give my email as a reference (petermkp@gmail.com) or ask me for a referral please. Still waiting on final grades to see if I finished with a 4.0 – I’m hoping!! Samplers, charms, and ice cream. 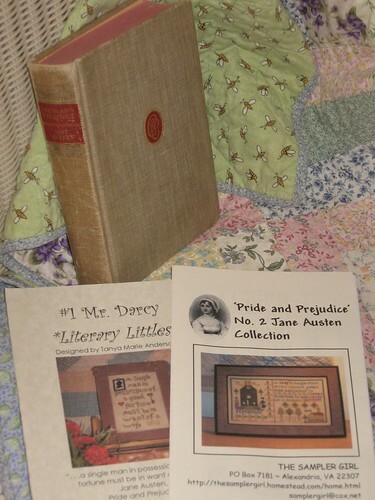 New items in my personal stash this week – the Pride & Prejudice Jane Austen Sampler and Mr. Darcy Sampler (new in the Literary Littles series) both from The Sampler Girl. I also found my old copy of Pride and Prejudice, or should I say Tyler did in HIS bookcase ?!?! I don’t know when this was published but someone wrote ‘October 7, 1947’ inside the cover. Amber picked this up for me somewhere I think. A local needlework shop has purchased several of my fobs. I’ve been busy making more and these are some of the charms on the newest fobs I’ve added to the ‘Fobs 4 Sale’ link at the top of the page. Last night was the kick off carnival for AWANA. I took the 2 youngest boys since Jerry had 2 ball games he was pitching for (after 18 holes of golf). It got quite chilly last night and by the time the sun was setting jackets were needed. 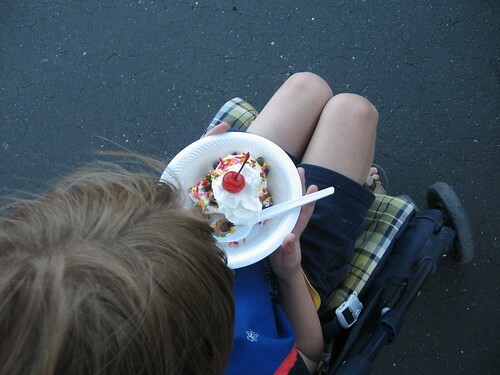 Ethan thought this ice cream sundae that someone made for him was too pretty to eat. Kellen had a blast dunking my old bosses’ grown son in the dunk tank – his throwing accuracy has definately improved! PS – Happy 23rd Wedding Anniversary to my other sister and her husband! I’ve made some progress on my little Meg’s Bunny project from Sheepish Designs and added a few more titles from that same designer to my stash! I need to round up the Anchor thread before I can get started on those. 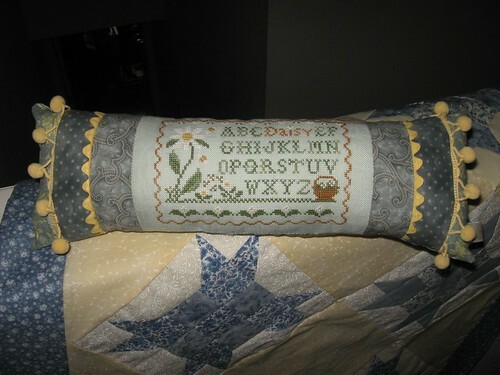 Thank you so much for all the wonderful compliments on my little Daisy Sampler pillow. It was a fun project. Also, thank you for all the support for my beaded fobs. 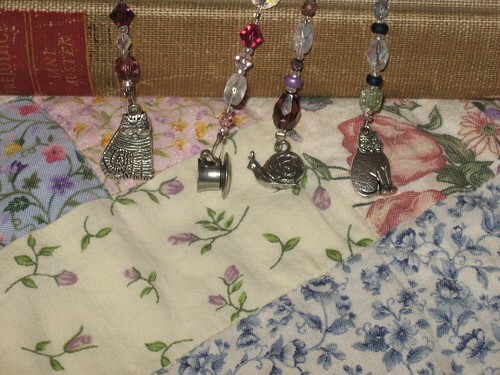 I’ve picked up more beads and more snail charms, also some little kitty charms so watch for new additions at my Fobs 4 Sale link at the top of the page. As a treat for being done with school I took myself to Borders to pick out a book as a present to me. 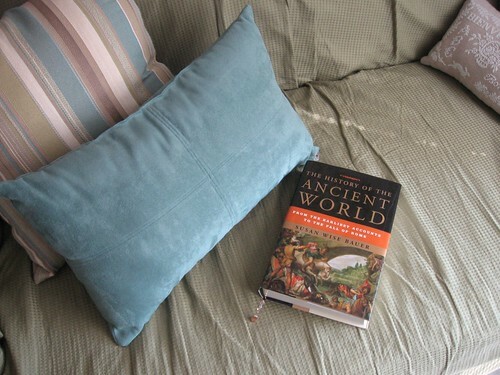 Something I can just read because I want to. My family had a good time teasing me when I brought home this book! 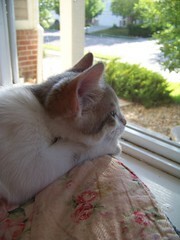 I really enjoy this author’s blog (there is a link under ‘Blogs I Read – homeschooling). I’ve also created a book list at Good Reads. Speaking of school, I’ve warned the boys that the party is over and we will be getting back to full days of school VERY soon! I stitched this Daisy Sampler from Country Cottage Needleworks quite a while ago and had this finish in mind from the beginning. It is good to finally have the time to finish it. I’m still making lots of fobs – click on Fobs 4 Sale here at the top of my blog if you’d like to see more. I want to apologize for my rant yesterday (maybe I should just delete it). I don’t want to have that tone at my blog. ~ ~ Moving On!! 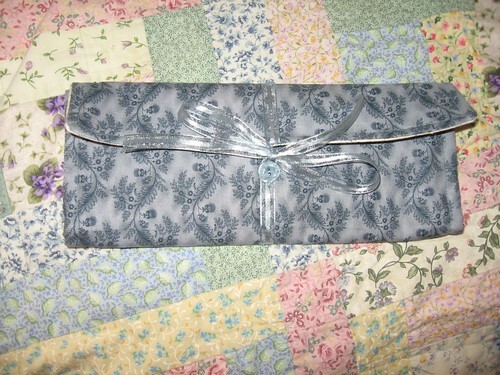 I liked the fabric that I picked up yesterday so much that I decided I had to make something with it this morning. 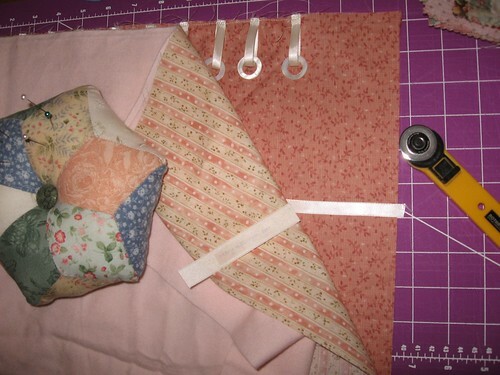 I didn’t use interfacing so it is a little floppy with just a layer of flannel (maybe two layers would do the trick). But after some trial and error I came up with this little roll using those great Kelmscott thread rings – I think it turned out fine. 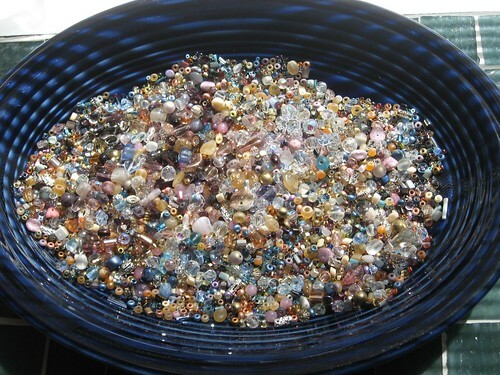 My bead collection is growing, I’ve seen those bead organizers but I like to just dump them on a platter and see what catches my eye. I made a new purple fob and added it to my Fobs 4 Sale link above. 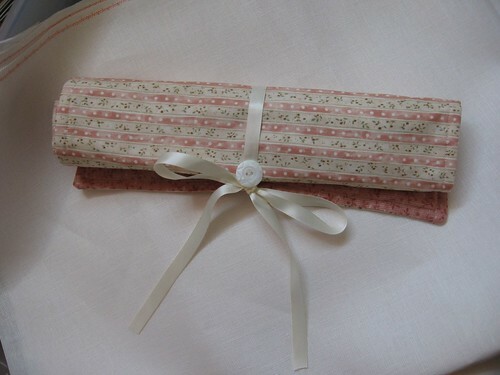 I’ve had some emails about the pink linens in my last post. They are all Belfast (32ct) and in order from light to dark are Bo Peep Pink, Baby Lotion, and Cameo Rose.